Riots over murder of Arab teen leaves thousands unable to travel to their jobs; inspectors still unable to fully assess damage. 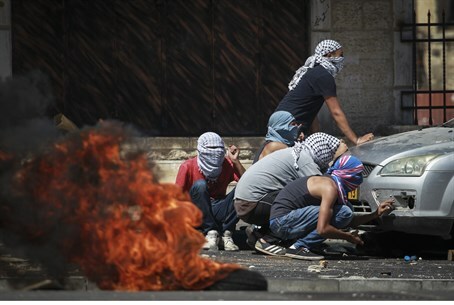 The Arab rioting Wednesday in northern and eastern parts of Jerusalem is likely to have a long-term negative economic impact on the communities where the rioters themselves live. During the course of the rioting, Arabs severely damaged three stations of the light rail system – and officials say it will likely take months to repair them. As of Wednesday, service on the light rail was suspended beyond Ammunition Hill, so the stations serving areas like Beit Hanina and Shuafat – which thousands of residents depend on to reach jobs in other parts of the city – will now remain closed. The Jerusalem municipality and the City Pass group, which manages the light rail, did not state when repairs would begin, but that they would take several months, at least. Shuttle buses will be provided for passengers from the Ammunition Hill station to the next stop at French Hill (Givat Hamivtar). There will be no service to the stations beyond – Al-Sahel, Shuafat, and Beit Hanina. After those stations comes Pisgat Ze'ev, which has bus service to the center of the city – unlike the Arab neighborhoods. Among the damage caused by rioters at the stations was the destruction of ticket machines, the destruction of rubber tracks by rioters who set fire to them, demolishing of the traffic lights at intersections of the road and the tracks, vandalism of the electricity and communication infrastructure, and the ransacking of at least one electricity control center. A full catalog of the damage will not be available until inspectors can get to the scene to assess the damage. On Thursday, police prevented the inspectors from approaching the stations, out of fear that Arabs would begin rioting again.